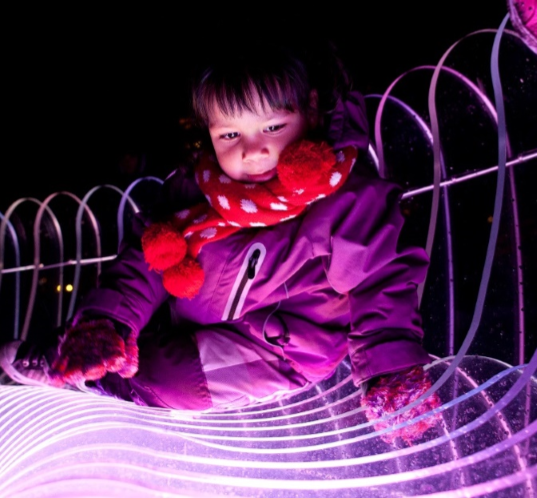 Angela Chong wanted to use the property of a material and create a sculpture which functions as a seat for the public. As clear changes to colours, the visual effects switch from having a dynamic shadow play in the day, to a colourful light show in the night. The seat consists of thick acrylic sheets of 15mm, each held together at three points by stainless steel bolts and nuts for safety and stability. A graduate from RMIT Bachelor of arts, Fine Arts (Honors), majoring in sculpture, installation artist Angela Chong has a keen interest in creating narratives in her installations, blurring between fiction and ‘reality’. Using with light and darkness in her installations, she entices her audience to question the emotional attachment between the object and its owner, in the context of history and site-specificity.